Cat lovers all over the world may think there is really nothing cuter than their furry friend doing all the things she naturally does, but they might be wrong. As it turns out, fun and comfortable cat apparel for beloved pets can create a cuteness overload! 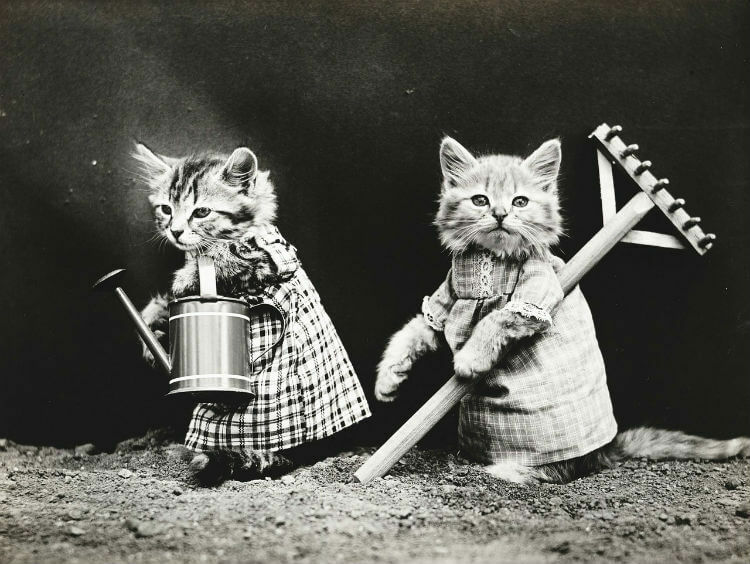 😻 Some cat outfits, like holiday costumes, are just for enjoyment and snapping cute pictures; other types of pet clothes can help kitties stay comfortable in extreme weather. There's a lot to consider when picking out what an animal should wear. Some questions every pet parent needs to ask before deciding on any certain apparel: Would their furry feline friend enjoy wearing an outfit? Could she like a cozy hooded sweatshirt to keep out the winter chill? Above all else, is the clothing comfortable and 100% safe? A cat costume provides the perfect opportunity for pet parents to dress up their fur babies. Most costumes consist of a hoodie or coat-like covers printed with a unique design, collars with extra accessories, and hats or headgear of some type. 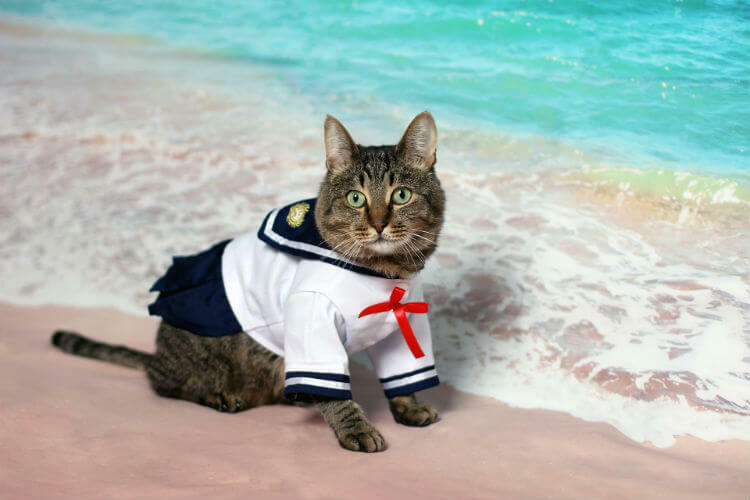 Other options include more structured costumes that cover the cat's chest and forelegs. These may even have stuffed arms or other accessories to make the front of a pet cat look like a tiny walking pirate or ghoul. 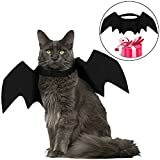 A specialized cat coat can make any appropriately sized animal look like a dinosaur with spikes, a taco, or a vampire in a cape, among many other designs. Halters that slip around a pet's front legs can add fairy or bat wings to her outfit. Note that masks are not recommended for pets of any type. Of course, Halloween isn't the only holiday where pet owners can glam up kitty. Cat Christmas outfits can really make any fur baby stand out during winter festivities. Owners should avoid tinsel for cats, though, because they tend to chew on it. This can damage their digestive tracts. 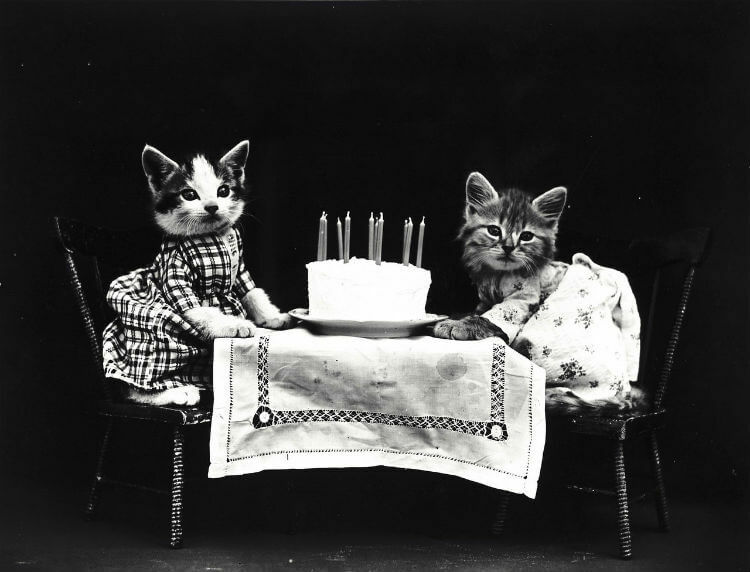 For birthdays or any other special occasion, pet parents might think about buying colorful collars or scarves, funny hats held on with gentle elastic, sparkly bow tie collars, or tutu skirts. A trip to the pet shop will show no end to cute outfits available! Owners interested in saving money on holiday-specific costumes might look into holiday sales or sales immediately after the holiday has ended. With this latter option, it might mean holding on to the outfit for a bit, but it can save money in the long run. Not all cat clothes are just for show. 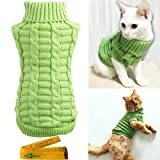 Felines with sensitive constitutions, small kitties, and hairless varieties may need extra warmth in the colder seasons of the year. A waterproof cover or specially designed cat jacket can help in times with a lot of rain or snow. This is especially important if kitty spends any time outside in an unheated porch. Owners should often check on a pet when wearing a warm cat sweater, hooded sweatshirt, or fleece cloak. Sometimes felines can become overheated, just like people. These types of outdoor pet gear usually slip over the head and front legs or are held on by straps around the neck and chest. Small pet dog clothes may work just as well as specially designed cat clothes. (Hey, if there's sale, take it!) It is important to buy pet clothes that fit well without binding, rubbing their fur excessively, or irritating skin. Ones that are too loose can be tripping hazards or interfere with normal running and jumping. The key is to find the best fit possible so it stays in place and provides warmth or protection as intended. Owners should shop around for clothes in their pet's size. Pet owners frequently enjoy dressing up their animals as if they were dolls so they can get adorable pictures to share with family and friends. However, special occasion and holiday costumes should not become permanent items fur babies wear all the time. Instead, find items specially designed for everyday home wear. 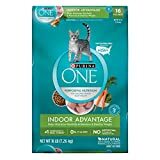 In the last two instances listed above, a family veterinarian may recommend particular kinds of shirts for cats or wraps for the animal to wear. If a specifically crafted cat t shirt isn't available, a baby or child t shirt cut appropriately may be sufficient to protect a bandage from chewing or tearing. If the vet shaved kitty considerably, she may become cold. A fleece pullover might make sense here. Again, concern pet parents always ask a vet what would be appropriate for their feline friend to wear during this time. 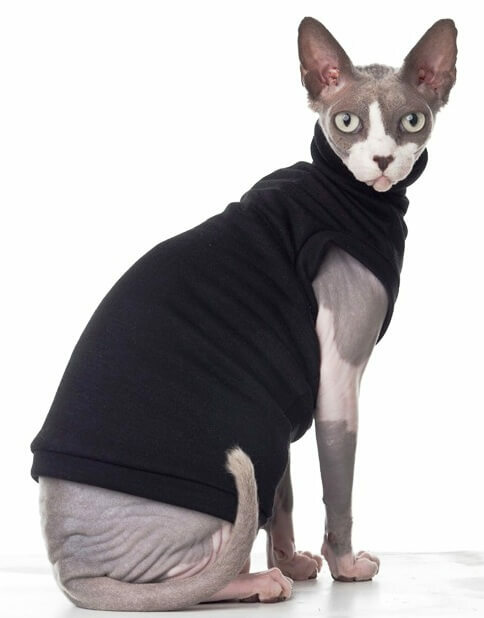 Experts agree that putting a sweater or jacket on a cat every day will result in over-heating, discomfort, and potential illness. Cats already have natural fur coats that keep them warm both indoors and out. 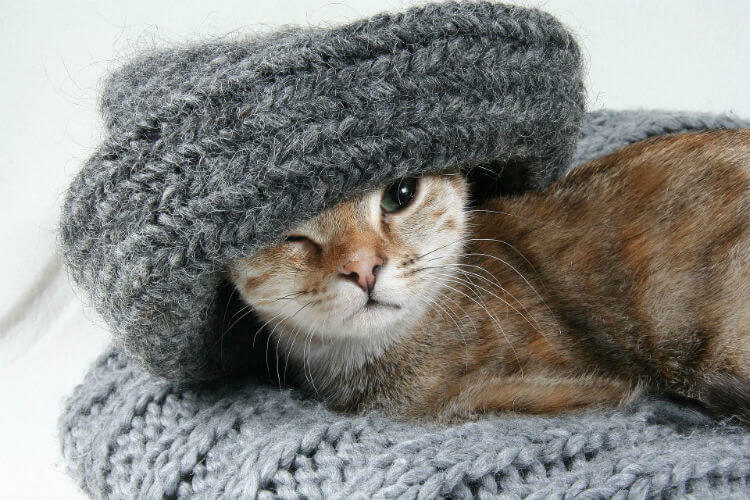 Stick with accessories and smaller items with less coverage if you want your pet to wear something unique every day as she goes about her usual cat business. It might take cats a little bit of time to get used to outfits, but the right clothing shouldn't get in the way of normal feline activities. 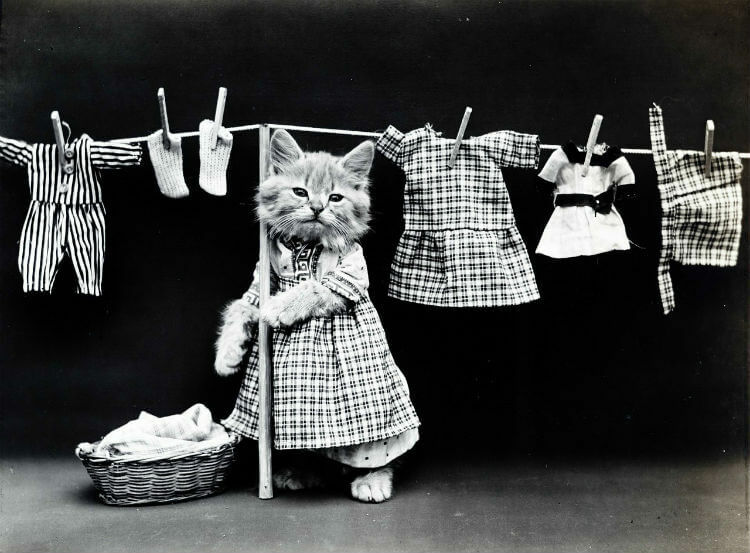 Owners can expect some period of adjustment with any piece of cat clothing. Pet parents should always pay attention to their cat's mood after trying something new. In the quest for cuteness and showing off fun pictures, they should be sure not to aggravate kitty or cause anxiety. The last thing any pet parent wants is to foster distrust in the one person their fur baby should be able to count on at all times. Every single outfit, piece of apparel, costume, or accessory put on a cat in must abide by these requirements. Cats are going to do cat things like chase, jump, scramble, and roll around. Clothing that restricts these activities reduces a pet's quality of life. Custom cat collars offer a sense of style without adding anything too unusual or complicated to an animal's life. Since they come in a wide variety of materials, colors, patterns, and trims these days, a determined pet parent can definitely find on that suits personal tastes well. Perhaps a princess would prefer a pink faux diamond-studded collar or a tough tom would go for black leather with spikes. Important: Authorities like American Humane state that cat collars should either have elastic or break-away clasps. This prevents them from getting choked if the collar catches on something. Some pet owners opt for necklaces instead of collars. These offer an elegant and unique way for fur babies to show off some style. Pet parents should not, however, place anything on a cat that can dangle. This would increase the chance of the pet getting hung up on something. Never use one designed for humans. The ones specifically designed and crafted for animal use should have a stronger and shorter string. Accessories can come in a variety of material options. As such, owners won't need to settle for an item made with sub-quality material or fabric not suited for its intended purpose. There are plenty of options on the market, after all! Common materials for holiday and party costumes include nylon, polyester, fake fur, and synthetic fleece. Although natural fabrics are available, they are much less common. Synthetics tend to hold up well through rugged use and multiple washes. The fit comes from elastic and hook-and-loop closure straps such as Velcro. Everyday outfits such as sweaters and coats are also primarily composed of manmade materials. Knit sweaters typically come in cotton and wool, though acrylic yarn is common as well. Waterproof items are either treated nylon, vinyl, or plastic. When using these materials, owners must always make sure their pet's skin gets enough air so she doesn't overheat or build up uncomfortable condensation. Collars are often leather, faux leather, strong nylon webbing, or polyester webbing. Decorations on the collar include anything from plastic gemstones sewn on to a velvet bow tie collar. No matter the style, the decorations cannot detach easily. That gemstone collar might look pretty, but if it's shoddily made, the gemstones might pop off. This can be hazardous for pets. No matter how adorable cat or kitten clothes are when they wear their costumes or other apparel, safety always comes first. Pet parents should never allow their fur baby to wear anything that could potentially cause problems. Only get fabrics with non-toxic dyes and ink. Avoid little appliques, beadwork, or baubles. Some of these present choking hazards if cat bits them off the fabric, or could get lodged in their throats or digestive tracts, causing more serious problems. Some cats chew on everything put on their body and even try chewing on their collars. Proper fit helps prevent this in many cases. When buying pet apparel, the most important factors are safety and comfort. Small dog & cat clothes sold at a store have recommended sizes and weights for the animal wearing it. If making customized costumes or outfits, owners should be sure to follow safety guidelines to avoid accidentally doing anything that could endanger a pet. Cats and kittens are adorable. There is no denying that! Dressing them up for the holidays, slipping them into a cozy cat sweater on the coldest winter days, or fancying them up for a family portrait only ups their cute factor. 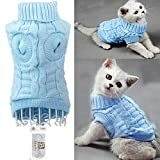 No matter the style, though, pet parents must take responsibility by making sure that their cat's apparel is not only comfortable, but safe for kitty. If these requirements are met, owners can definitely snag some adorable photos of their feline friends (if they'll sit still long enough for the picture, that is).